Whatever is promised to you by God in His Word (e.g., prosperity, healing, deliverance, peace in your home) is available and delivered only by faith. Every believer must learn how to go into God’s Word to develop their faith for the task that has been given to them and “turn faith loose.” This is how faith grows, which is the responsibility of every believer. 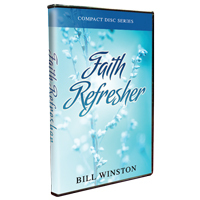 Let this powerful teaching by Dr. Bill Winston during the 2014 Faith Refresher grow your faith and take you to greater dimensions of doing bigger and better things for the Kingdom of God.